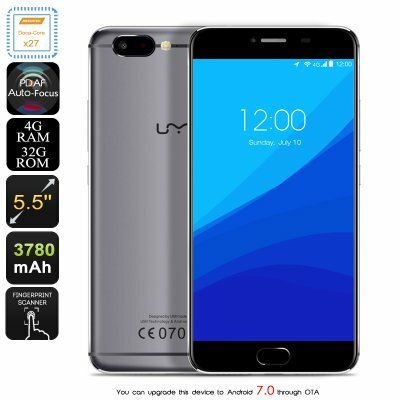 Successfully Added HK Warehouse UMi Z Smartphone - Android 7.0 support, Deca-Core Helio X27 CPU, 13MP Camera, 4GB RAM, 4G (Grey) to your Shopping Cart. The UMi Z is the first flagship smartphone that is announced to be released in 2017. Being among the first smartphones that is powered by the incredible Deca-Core Helio X27 chipset, this Android phone is guaranteed to bring along a performance like never experienced before. Built for speed and energy efficient usage, this extremely powerful CPU that has been clocked at 2.6GHz packs all the power needed to handle the latest and most demanding games, movies, and applications available on the market today. Added to its state of the art CPU, this Chinese smartphone furthermore features a mesmerizing 4GB of RAM that lets you engage in excessive multitasking sessions without you ever needing to worry about slowing down your device. With all this power hidden under its hood, the UMi Z smartphone allows you to take the absolute most out of your mobile experience – letting you enjoy an exceptionally smooth and fast user experience as never experience before in the smartphone industry. This Chinese flagship smartphone comes pre-installed with the well-trusted Android 6.0 operating system that packs all the trusted features Android users are familiar with. Being a real trendsetter, the UMi Z supports an Android 7.0 upgrade – allowing you to update your operating system and to enjoy all the new and amazing features that come along with Android Nougat. Packing an epic 3780mAh battery, this Android smartphone brings along plenty of juice that supports a continuous usage time up to 20 hours – allowing you to take the absolute most out of all that the UMi Z smartphone has to offer. Watch multiple Full-HD movies from beginning to end, enjoy a day filled with mobile gaming, or simply browse the web for hours in a row – with this Chinese smartphone in your pocket you’ll get through the most demanding of days without ever needing to recharge your device. Along with its sleek design, this latest Android phone features a beautiful 5.5-Inch Full-HD display that lets you enjoy all your favorite media in breathtaking 1080p resolution. Delivering high detail and vivid color – this 5-Inch smartphone truly delivers a cinematic experience from the palm of your hand. Coming with 32GB of internal memory and the added possibility to insert a 256GB TF-Card, the UMi Z smartphone is guaranteed to hold enough storage for you to save all your favorite media, games, and files alike. With this Android phone in your pocket, you’ll be able to carry along a day’s worth of entertainment – ensuring that you’ll never have to be bored again. For all the smartphone photography lovers out there this latest Android phone packs two 13MP cameras that, with its 5 element lenses, support all your professional photography demands. Capable of shooting mesmerizing images and recording 4K video, these Samsung cameras allow you to capture all those unforgettable moments in life in breathtaking resolution. Whether you’re spending a night out with your friends, attending a sports game, or enjoying a stunning landscape during your upcoming holiday – with this professional-grade camera in your pocket you can be assured that not a single special moment in life passes by uncaptured. Awesome phone fast beautifull very good cameras. For my needs i think it was the best choice in the right price. My previous phone was umi c1 and i had no problem still working right. The delivery time was good. Thank you. Awesome power, awesome price, beautiful design, perfect android phone, i love it! i don't have this phone yet, but hoping i won the giveaway promo ^_^ hihi positive vibes is on me! yeah! The best smartphone. after I watched your review on youtube of Chinavasion.